Viewers can watch the musical-comedy starring Laura Benanti, Zachary Levi and Jane Krakowski before it closes July 10 — and at a fraction of the cost of a live ticket. For the first time ever, a Broadway show will be live streamed online. She Loves Me, the hit musical-comedy revival starring Laura Benanti, Zachary Levi and Jane Krakowski, will be broadcast live on Thursday, June 30 at 5 p.m. PT/8 p.m. ET. Directed by Scott Ellis and choreographed by Warren Carlyle, She Loves Me follows quarreling 1930s perfume-counter clerks who are unaware that they are each other’s anonymous romantic pen pals. Nominated for eight Tony Awards — and taking home the award for David Rockwell’s scenic design — the Roundabout Theatre Company’s limited engagement runs through July 10 at Studio 54. To watch the show, viewers can reserve a live stream pass online for $9.99, or watch for free as part of an annual subscription to BroadwayHD’s on-demand library, available on its Roku and Apple TV apps. After the live stream date, the broadcast will be added to the on-demand library, which currently boasts more than 150 titles. Previously, the platform live streamed a behind-the-scenes show during Sunday’s Tony Awards, as well as off-Broadway productions of the New Group’s Buried Child and Signature Theatre’s Old Hats. It aims to live stream more Broadway shows in the future, including a production’s opening night. She Loves Me’s livestream will be the culmination of a particularly digital-friendly Broadway season, which also included Waitress’ score primer via Sara Bareilles’ livestreamed concert, music videos from the casts of The Color Purple and School of Rock – The Musical (the latter in YouTube’s new 360-degree format) and Hamilton’s #Ham4Ham concerts for lottery hopefuls. 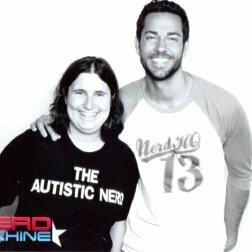 This entry was posted in Zachary Levi. Bookmark the permalink.